CULLMAN – No ash, no tar, no second hand smoke and no smell are just a few of the obvious benefits of vaping. Some claim that electronic cigarettes are a healthier alternative to smoking, while some claim since the long term effects of vaping are unknown, it’s safer to stick to traditional cigarettes. If you or someone you know is a smoker, it’s important to know the truth about vaping. E-cigarettes are devices that contain a nicotine-based liquid that is vaporized and inhaled. They all work the same way: inside the device is a battery, a heating element and a cartridge containing the liquid. Some are disposable and others have rechargeable cartridges and batteries. These devices are also customizable. You can control the amount of nicotine which goes into your cartridge and how much vapor you get per puff. This will vary from person to person depending on preferences and how many cigarettes they smoke daily. This means you can change the amount of nicotine you want in your cartridge each time you change it, giving you the option to wean yourself from it. This customizable option has allowed many people to kick their deadly habit of cigarette smoking. According to a recent study, 44 percent of people chose to switch to vaping exclusively within the first 6 months after trying it for the first time. There are several advantages vaping has over traditional cigarettes. It is obvious that vaping is a much healthier alternative to traditional cigarettes. E-cigarettes contain no tobacco, no tar, no carbon monoxide and no smoke. 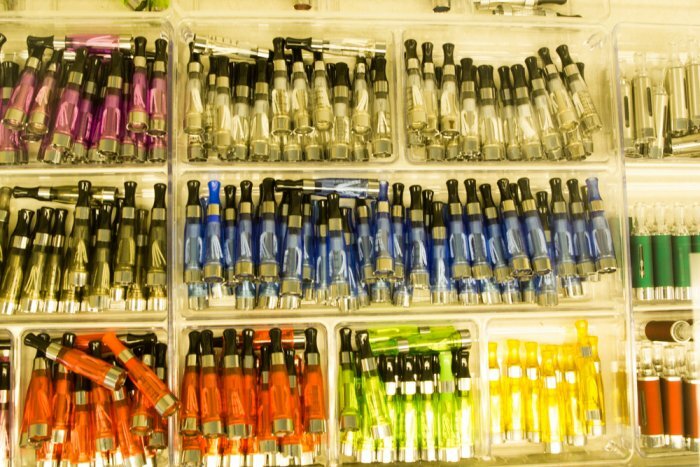 An e-cigarette contains about five chemicals, while a traditional cigarette contains about 5,000. While cigarettes destroy your dental health, most dental professionals report that the tooth and gum health of users who have switched to e-cigarettes are indistinguishable from those who have quit smoking all together. Additionally, vaping is a much less expensive habit than smoking. A pack-a-day smoker can save about $1,200 per year by switching to vaping. There are several other advantages from switching to vaping. For example, they are much more considerate to non-smokers. There is no ash, no smell and no smoke. So, you can vape indoors and in no-smoking areas. E-cigarettes produce no pollution, while about 4.5 trillion cigarette butts are tossed each year. People who have switched to vaping claim to experience higher stamina, productivity and efficiency. The benefits of switching from smoking to vaping are bountiful, but there are a few drawbacks. Since e-cigarettes have only been around about 10 years, there have been no long-term studies, so no one actually knows the long-term effects. Even though they don’t contain nearly as many chemicals as cigarettes, they do contain a few. On their website, the FDA says that “E-cigarettes may contain ingredients that are known to be toxic to humans, and may contain other ingredients that may not be safe.” The biggest drawback to vaping is that some of the effects are unknown. Though there are some drawbacks to vaping, most agree that despite the fact that the long-term effects are unknown, it is a much healthier alternative to cigarettes. The Vape Shop is an e-cigarette distributer here in Cullman. Owners Stacey and Paul Collins opened after discovering vaping for themselves. The Collins’ found so much success at the flea market that they outgrew it. They are now located in a shopping center on Highway 31 North. This shop is unique because they create their own liquid that goes inside the cartridges. These business owners are passionate about vaping. They believe it can save even the heaviest smokers from a lifelong addiction. “It’s a beautiful thing to see someone come in for help,” Stacey said. “Someone came in here who had been smoking for 30 years. I got her set up with an e-cigarette here, and she came back 2 weeks later and hadn’t smoked a cigarette since." The Collins stated that though it’s safe to vape forever, they encourage their customers to kick the nicotine habit eventually. “It can become a hobby,” added Paul. Stacey and Paul feel blessed with the success of The Vape Shop and see big things in their future. If you would like to learn more about The Vape Shop, visit their Facebook page or reach them at 256-620-0588. Know the truth about vaping. If you smoke, consider switching to this healthy alternative. This popular device might be a trend, but it might just save your life.